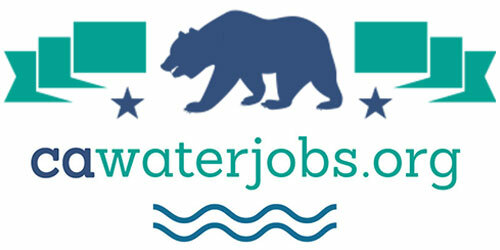 The state of California has set ambitious restoration goals for restoration of the Delta’s ecosystem as embodied in the Delta Plan; those goals include restoring large areas of interconnected habitats within the Delta and its watershed by 2100, establishing migratory corridors for fish, birds, and other animals along selected Delta river channels; and restoring, and where feasible, increasing migratory bird habitat. 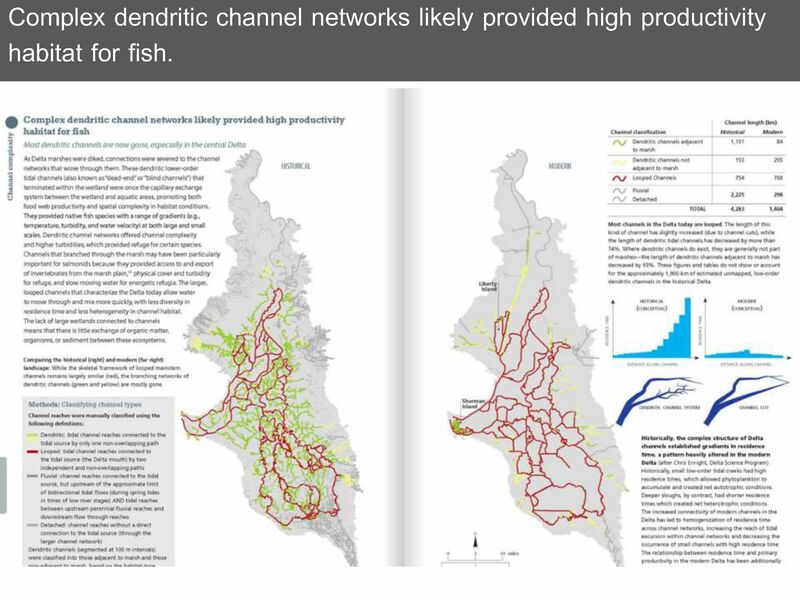 Other processes, such as the Bay Delta Conservation Plan, the biological opinions, and other regional planning processes also envision significant amounts of habitat restoration for the Delta. 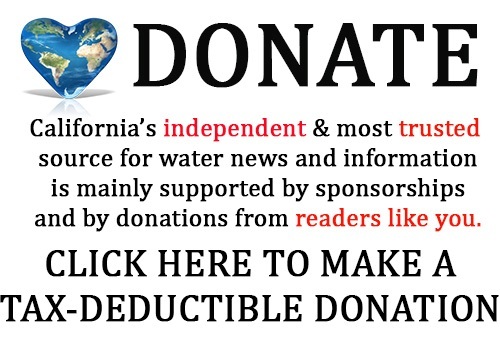 But how can restoration of the Delta happen on such a large scale? The Delta in its pre-development days was a mosaic of a wide variety of different habitats, from the floodplains in the north to the tidal marshes in the central Delta to the distributary channel network in the south: restoration will involve creating multiple types of habitat in various patches across the Delta. Furthermore, the Delta is not a blank slate on to which restoration projects can be laid at will; existing land uses have to be considered as well as locations and physical characteristics of the available parcels. 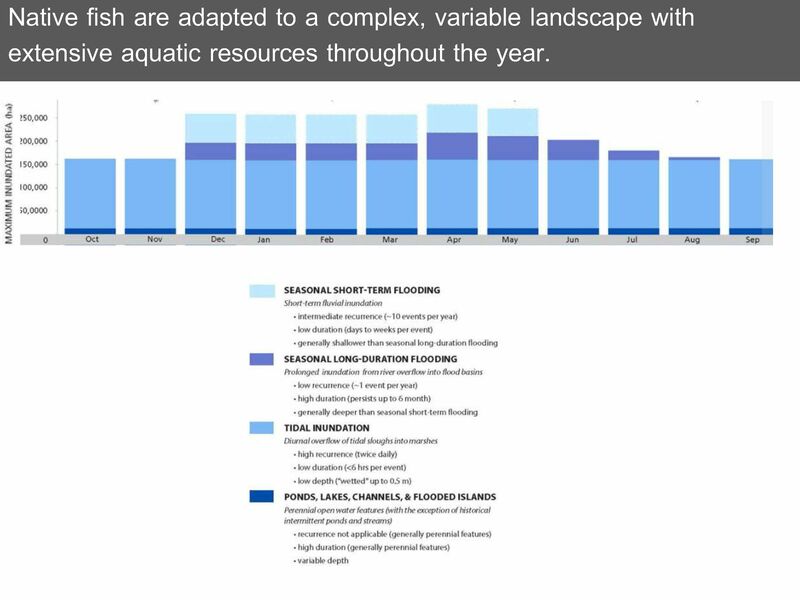 The challenge is to create an ecologically functional resilient landscape out of these smaller projects that are built incrementally and dispersed across the Delta. This will require a master plan that can integrate large landscape-scale thinking with the smaller scale projects. The San Francisco Estuary Institute-Aquatic Science Center is working on a project to provide that big picture thinking. The Delta Landscapes project is a multi-phase effort to develop a set of tools to facilitate large-scale restoration in the Delta that can be used by agencies, managers and restoration practitioners to design, implement, and evaluate projects that are effectively integrated with longer term landscape restoration strategies and are cost effective. 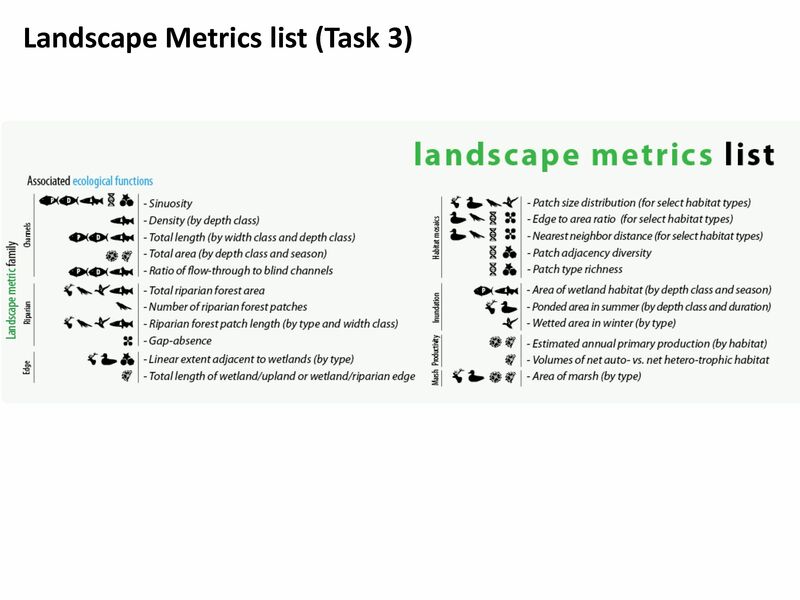 These tools include landscape-scale conceptual models, design principles, and target metrics. 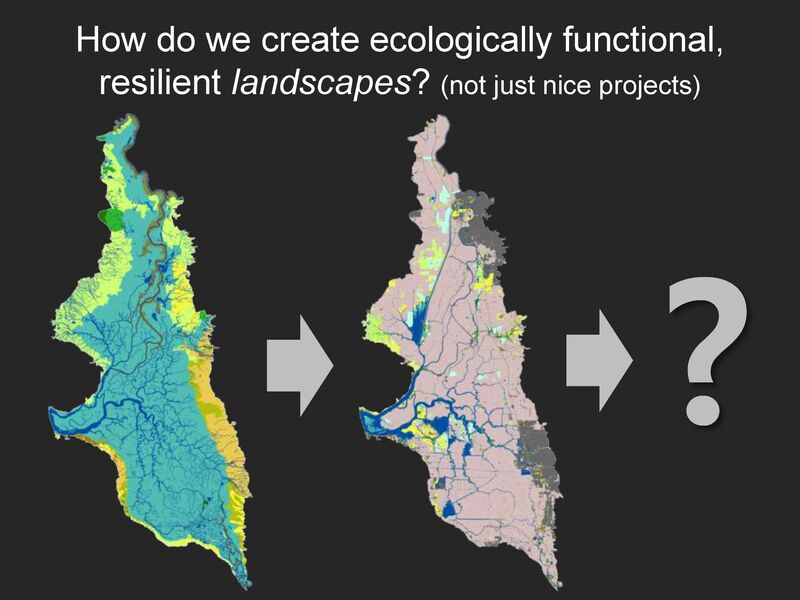 At the 2014 Bay Delta Science Conference, Robin Grossinger, Senior Scientist with the San Francisco Estuary Institute, gave a presentation on the first phase of the Delta Landscapes project and the release of the report, “The Delta Transformed: Ecological Functions, Spatial Metrics, and Landscape Change”. “Then there’s the challenge of species that need to cross this whole system in different ways and at a different times of their life cycle, and how do we think about that amongst the project’s stepping stones that we’re creating,” he added. 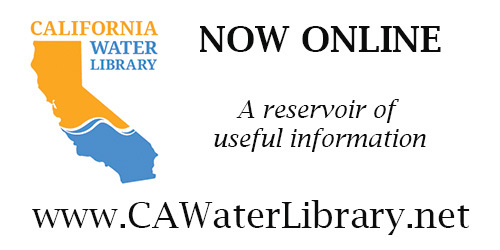 Click here for an interactive map of the Historical Ecological Study of the Delta. Building on the previous historical ecology investigative work completed two years ago, the Delta Landscapes project compares the present-day Delta to the historical Delta and analyzes how the historical and contemporary spatial habitat patterns and ecological functions that supported native species have changed. The first step to developing landscape metrics for the Delta was to define the ecological functions that the historical Delta provided. 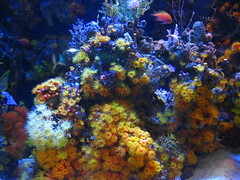 For the purposes of this project, ‘ecological functions’ were defined as those processes or manifestations of processes that support organisms. 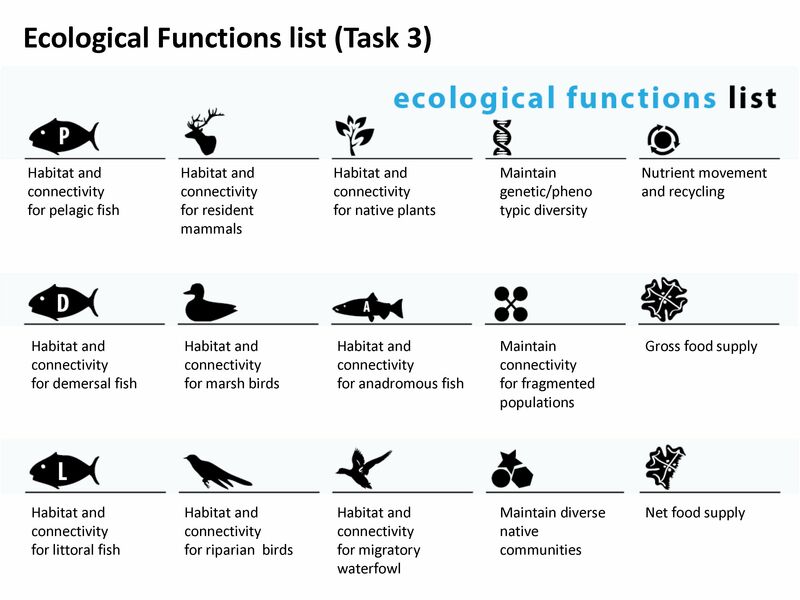 These functions were identified at both the wildlife population and the community level, and were then grouped into four themes: functions related to wildlife life-history support, functions related to wildlife adaptation potential, functions related to food webs, and functions related to biodiversity. Once the functions were defined, eight key functions were identified to focus on for this phase of the project. 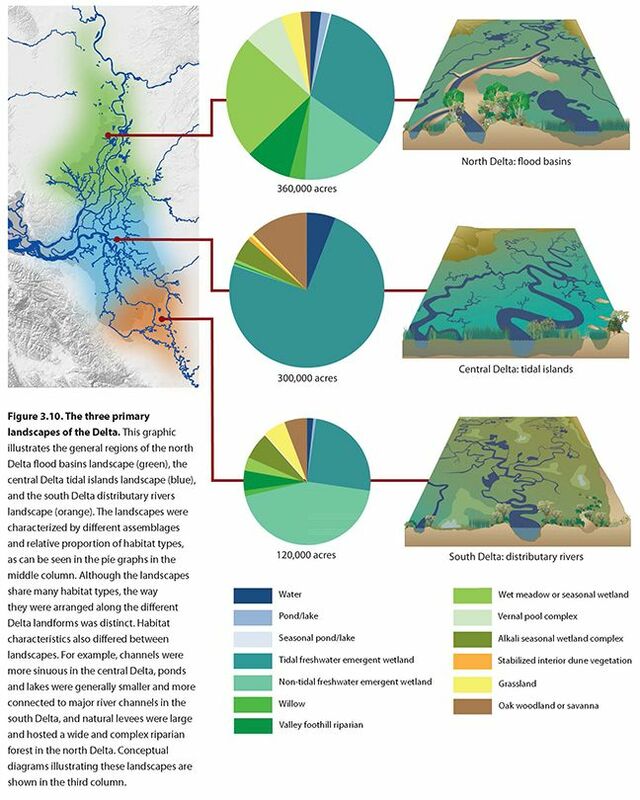 Landscape metrics were chosen that could be correlated to ecological functions and were feasible with the available data; those metrics were developed using spatial datasets for both the historical Delta and the modern Delta, and the two compared to determine the nature and the extent of the changes to the Delta’s landscape. Those changes have been significant. Mr. Grossinger then detailed just three of the many findings in the report. 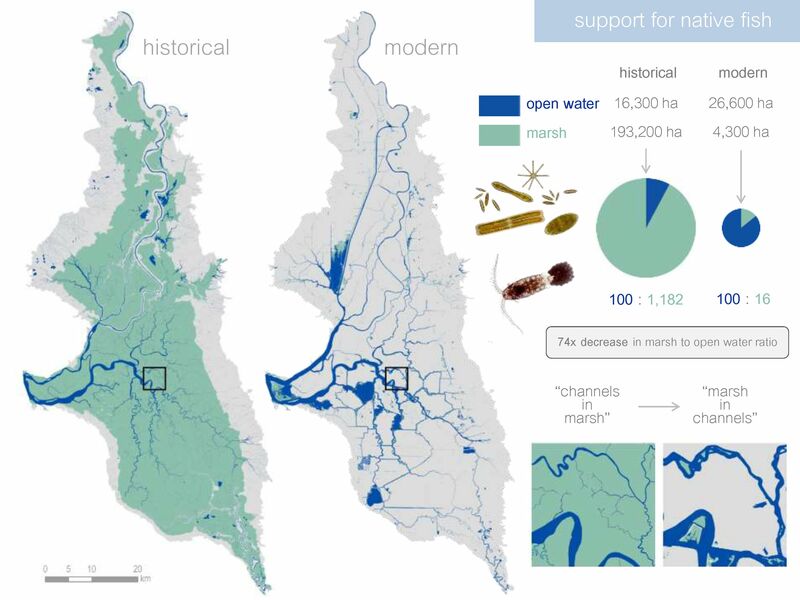 There has been a 73-fold reversal in the ratio between marsh and open water in the Delta, affecting the character and quality of aquatic habitats. 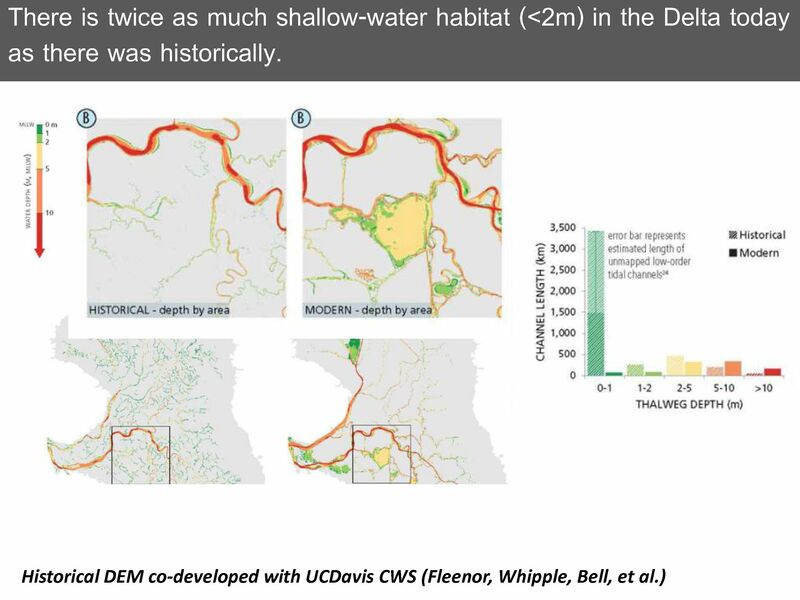 There is twice as much shallow-water habitat (<2m) in the Delta today as there was historically. Secondly, there’s actually twice as much shallow water habitat (less than 2 meters) in the Delta today as there was historically, he said. “Despite all of the changes, there’s actually more shallow water habitat, even though that’s something that we tend to focus on as something we need more of,” he said. “It looks like there was a lot of channels then and a lot of channels now, but they function completely differently because we’ve lost the ones that were dead end and had high residence time, and the characteristics associated with that, and we now have this relatively well mixed homogenous large channel system,” Mr. Grossinger said. Most of the temporarily flooded habitat available to fish in the Delta has been lost. Third, temporarily flooded habitat that was available has been greatly diminished, he said. “You can see that the deep water habitat, the open water and perennial waters, that’s somewhat increased,” he said. 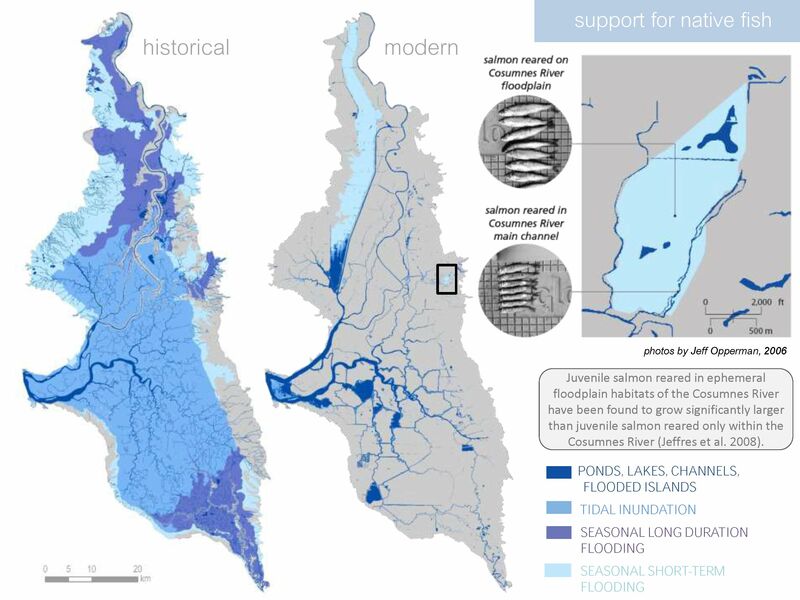 They also looked at fluvial driven flooding, both the short-term seasonal flooding associated with rainfall events, and the longer-term flooding associated with snowmelt on the San Joaquin and the Sacramento, where areas would be flooded for months at a time. “We have a little glimpse of the more temporary seasonal flooding in the Yolo Basin and also the Consumes, and we know from that from research by UC Davis and others that that is extremely high productivity for fish and that we’ve lost that in large part,” he said. A Delta Transformed: Ecological functions, spatial metrics and landscape change details the overall physical changes that have occurred in the Delta as it relates to ecological function, and analyzes different dimensions of the changes as it relates to different habitat-associated guilds, such as fish, marsh wildlife, and waterbirds. The report is full of maps, charts, and graphics and is available online as an eBook, downloadable as a pdf, or can be purchased in print. The report is the first phase of a multi-phased project scheduled for completion in 2016. Future products include developing landscape-scale conceptual models, restoration principles, and target metrics. 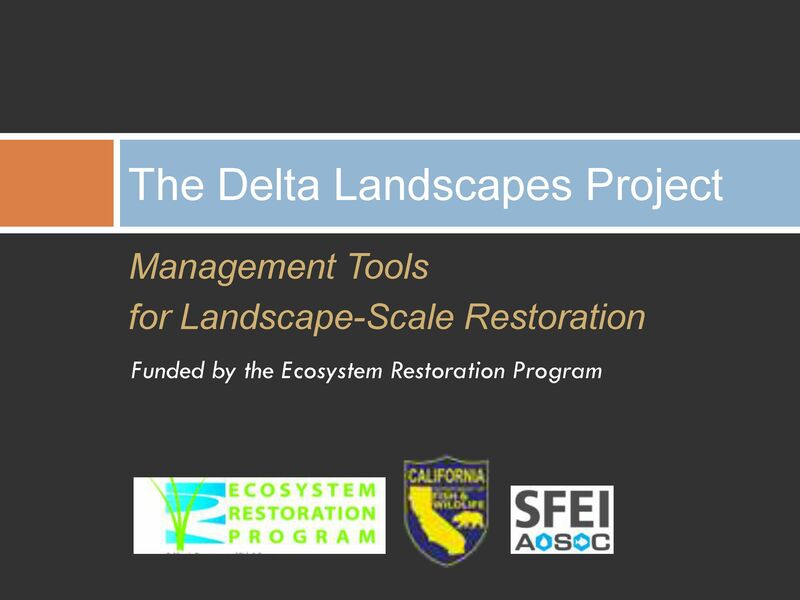 The Delta Landscapes project is funded by the Department of Fish and Wildlife and the Ecosystem Restoration Program. Links to all information on the Delta Landscapes project are available at this page.